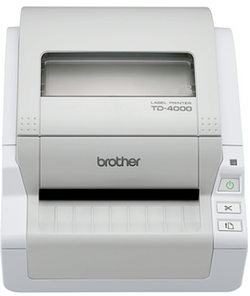 The TD-4000 prints up to 110mm per second and 300dpi, with a built-in automatic cutter. Your labels can be up to 102mm wide, and anywhere from 25mm to 3m long. The TD-4000’s P-Touch Editor software supports barcode printing, and also allows you to import graphics and date for a truly personalised solution – so this feature-packed professional label printer always delivers.